. 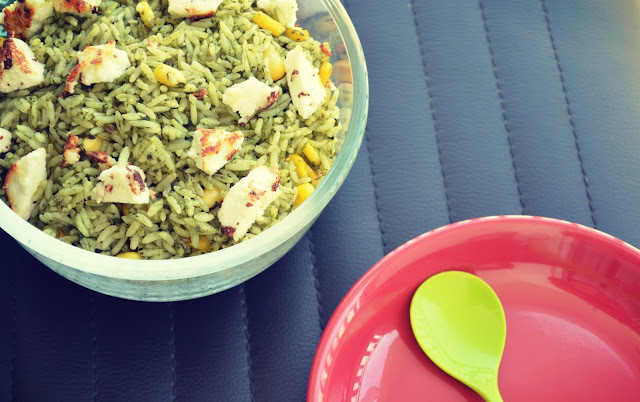 : Toddler Recipes-Spinach Corn Rice !! Toddler Recipes-Spinach Corn Rice !! Starting with a new series "Toddler Recipes" with an objective to share healthy and yummy dishes for your little ones.As a mom I am always looking for ways to introduce nutrition in my son's diet and I keep on experimenting in my kitchen. The recipe which I m going to share today is Spinach Corn Rice.I learnt this from my friend Ruby In London ..This rice dish was always a part of our potluck dinners.I just loved it the first time I had and have made umpteen times as its healthy and delicious too.Thanks Ruby ! !Trust me you will love it too..Its a great way to include greens in your kid's diet.I made it for my son and its his favourite now. Blanch Spinach and grind it with ginger into a smooth paste.Take oil in a pan and add cumin seeds and bay leaf.Add chopped onion.Once the onion turns brown add the spinach puree.Cook it for 10 minutes and add corn.Add salt and pepper and cook.Add a little water if required.Add cooked rice and mix it lightly.Garnish with paneer cubes and a dollop of ghee. A healthy meal is ready for your toddler! !